The “ice floe” skating rink of the Espace des Mondes Polaires is a fun leisure venue that recreates the majestic and sublime atmosphere of the polar pack ice. Videos and lighting effects recreate the Arctic aurora borealis to give you the sensation of a real-life expedition on the ice. We put on events for all ages and all levels: examples include our late-night openings with or without a theme that allow visitors to skate in a unique audio-visual environment, and our Ice Garden obstacle course. We hire out classic ice skates and double-bladed skates for our youngest visitors (€2.50). It’s also possible to borrow helmets for children and skating training equipment for everyone. Gloves and socks are mandatory for all skating activities. Children under the age of 2 are not permitted on the ice rink. 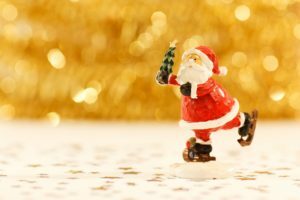 Get your elf skates on and come join the festive atmosphere of tinkling bells on the ice while you enjoy our free chocolates! 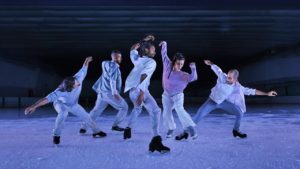 The Quebec company “Le Patin Libre” returns to Prémanon! Following their successful show last year, these ice artists are back in the rink with their modern, acrobatic and original style! The ice rink puts on themed late-night openings: Christmas, the 90s, Valentine’s Day, Carnival, etc. – check the what’s on page to see when these special evenings take place. Several activities suitable for different levels and accessible to both children and adults are set up on the ice: slalom, going through tunnels, getting over fences, etc. Share the joys of sliding about on the ice! Check the what’s on page.